Brandon Taylor of Archbold rolls out and is chased by Evergreen’s Isaac Yunker on Friday. 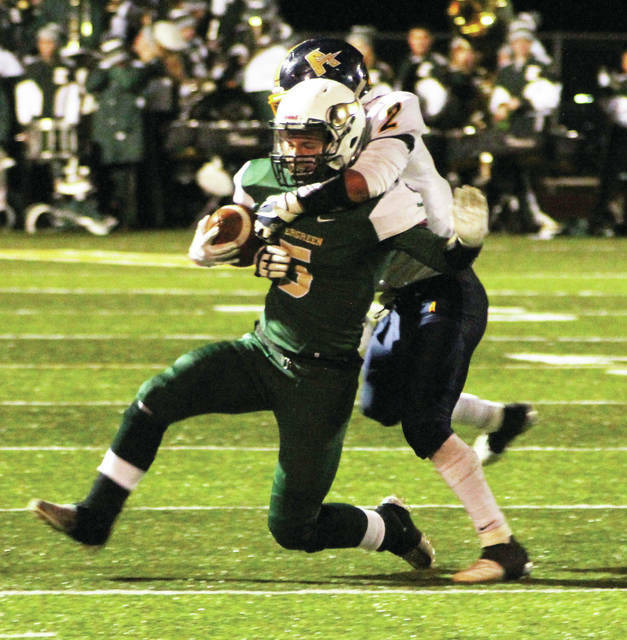 Hunter Vanwert of Evergreen is tackled by Zach Rocha of Archbold. Evergreen’s Landon Vance jumps on an Archbold onside kick attempt before Isaiah Gomez. Noah Gomez races to the end zone for a second half touchdown in Archbold’s 28-14 NWOAL victory over Evergreen on Friday. 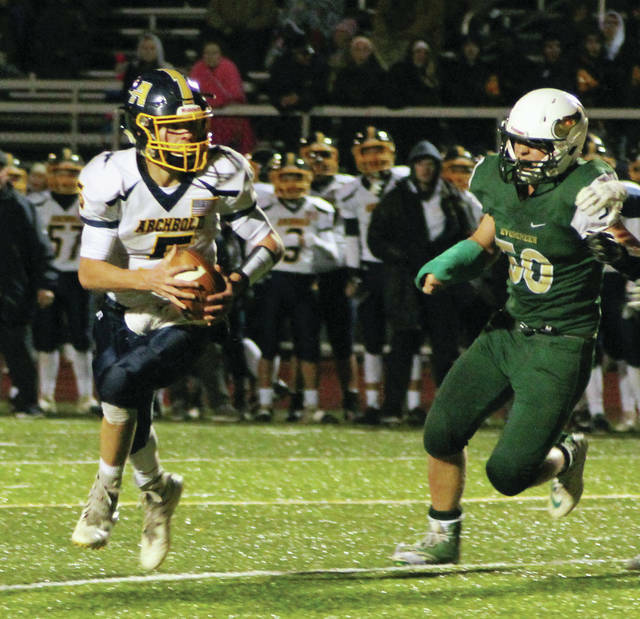 Archbold kept their playoff hopes alive and Evergreen had theirs almost extinguished as the Vikings five second half turnovers allowed the Bluestreaks to break a 14-14 tie and go on to a 28-14 win Friday at Pifer Field. Archbold is sitting in the nine spot in Division V, Region 18, needing a win over Swanton and some help to gain a spot in the OHSAA playoffs. Meanwhile, the Vikings’ loss all but ended their hopes in Division VI, Region 22. Evergreen needs a win over Bryan and a world of help to get into the post-season. A couple of Jack Etue passes to Bryce Hudik and Jack Krispin, along with Hunter Vanwert’s 56-yard jaunt gave Evergreen the ball inside the 10, but a mishandle in the backfield was recovered by the Streaks to end the Vikings’ scoring chance. Caleb Hogrefe’s 39 yard pass to Antonio Cruz was the key play in the Streaks’ ensuing 89-yard drive that ended on the first play of the second quarter with Brandon Taylor’s four yard run that gave Archbold a 7-0 lead. 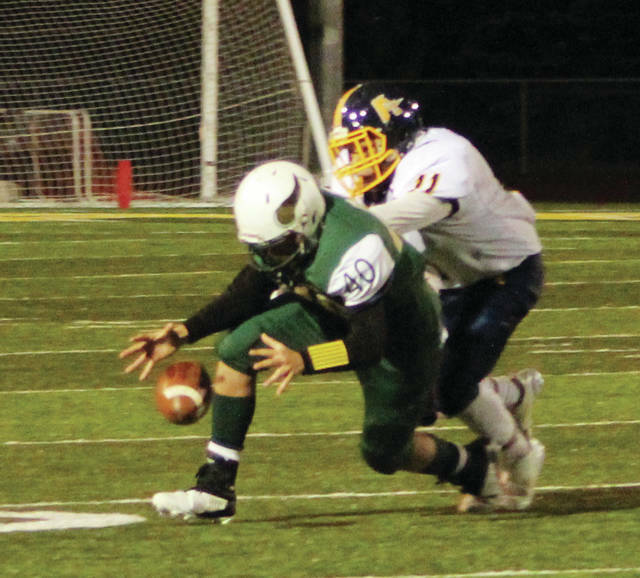 Hudik’s interception two series later set Evergreen up at the Archbold 39, and with the help of a pair of Streak personal foul penalties, Trent Coopshaw found the end zone from a yard away to knot the game at 7-7 with 4:43 left in the half. After another Archbold punt a Chandler Lumbrezer catch of 13 and a Vanwert burst for 53 more set up Coopshaw again with a scoring run again from a yard away to put Evergreen ahead 14-7 with 1:37 left in the half. 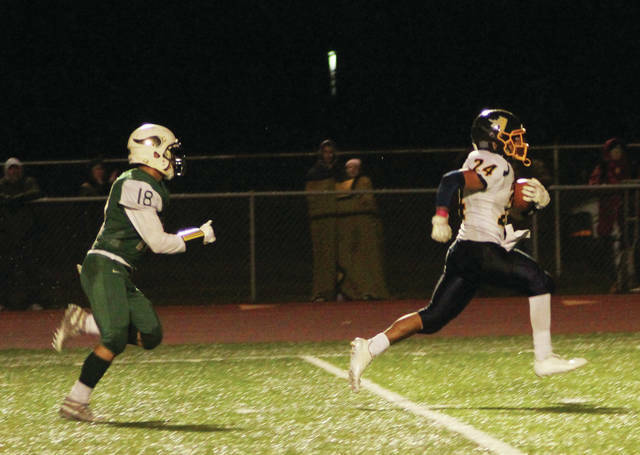 Cruz’ kickoff return to the Evergreen 45 gave Archbold great field position and the Streaks took advantage on Cruz’ 20 yard run and Taylor’s 18 yard scoring pass in the corner of the end zone with 30 seconds left to Isaiah Gomez to re-tie the game at 14. The Vikings weren’t done for the half as Vanwert got loose again for 52 to get to the Streak 10 with five ticks left. However, Nick Beemer’s field goal attempt went wide. Beemer’s first down catch to start the second half got the Vikings going, but Etue’s next pass was tipped at the line of scrimmage and picked off by Carson Meyer at the Viking 39. Three plays later, Gomez got loose in the middle from 32 yards out to give Archbold a 21-14 lead. Elijah Zimmerman picked off a pass two plays later, giving the Streaks the ball at their 34 but nothing came of that opportunity. Evergreen went for it on a fourth-and-two at their own 36 on the next possession but came up empty and Archbold took eight plays to find the end zone on Hogrefe’s 3 yard run just before the end of the third quarter. Evergreen had chances in the fourth but interceptions by Tony Grime and Noah Gomez stopped two of those drives, and Holden Galvan’s fumble recovery when Coopshaw lost control of the ball in the second level stopped a third Viking possession. Archbold ended with 223 yards on the ground and 151 in the air as Taylor was an efficient 10 for 16. Evergreen ran for 203 yards – including 174 from Vanwert on just 15 carries – but was only 9 of 23 in the air for 69 yards.